I joined in the Ensayos collaborative in the summer of 2015. 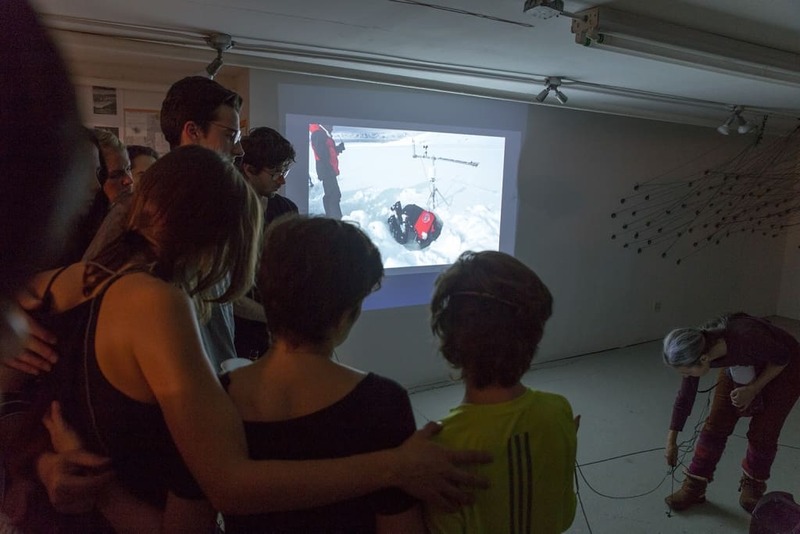 By then, the group had been collecting a multi-media archive of its discussions, experiments, and activities for over four years. It was time to take stock of the paths Ensayos had traveled until then, to reflect on the present, and to imagine the future. As a sociologist, I brought to the group a background in qualitative data gathering, including ethnographic interviewing and participant observation; and experience building and analyzing social, narrative, and conceptual networks. 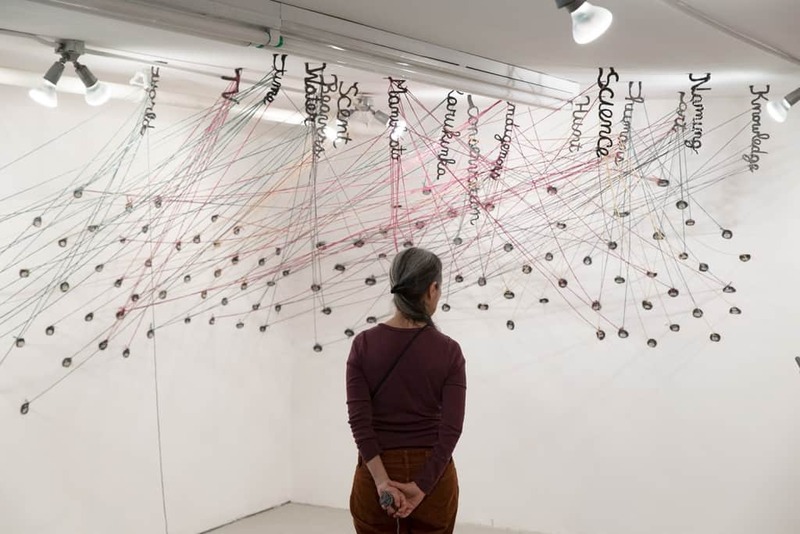 The desire to see Ensayos reflected in a new medium motivated this project, which used qualitative data coding, network analysis, and participatory action research to build a conceptual network installation at the Bruce High Quality Free University Gallery in the fall of 2015. 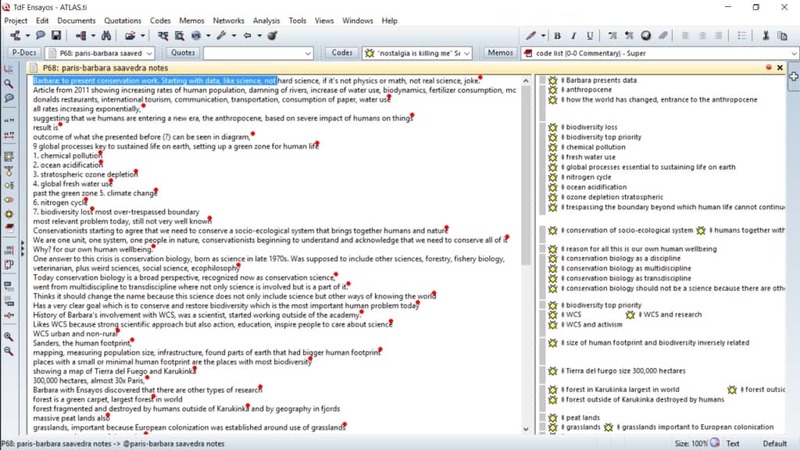 I set out to code the archive for concepts that appeared in relation to each other in audio interviews and discussions, videos, and written documents. 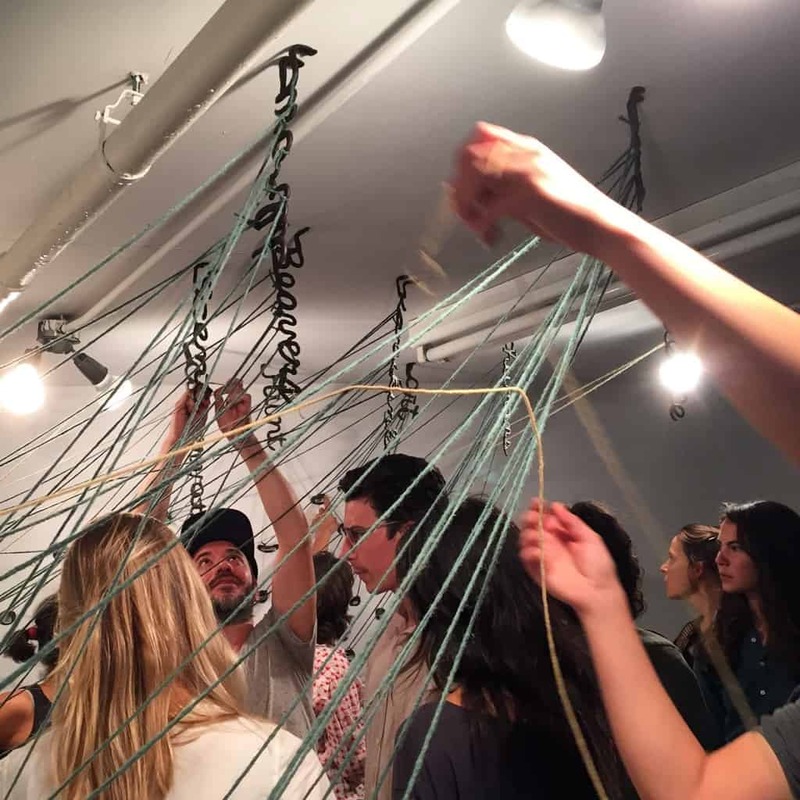 I aimed to build a network with those concepts, and to collaborate with Christy Gast to express it in a way that would allow participants to explore it, to engage with it, and to use it for thinking toward the future. Below I describe the process in three steps which seem distinct but, in reality, overlapped with one another over the course of the work: coding, analyzing, representing. Coding can evolve in different directions depending on the question one poses to the documents. I was interested in tracing the evolution of ideas or concepts in the group. By concept I mean “a general idea or notion, a universal; a mental representation of the essential or typical properties of something, considered without regard to the peculiar properties of any specific instance or example,” as defined by the Oxford English Dictionary. 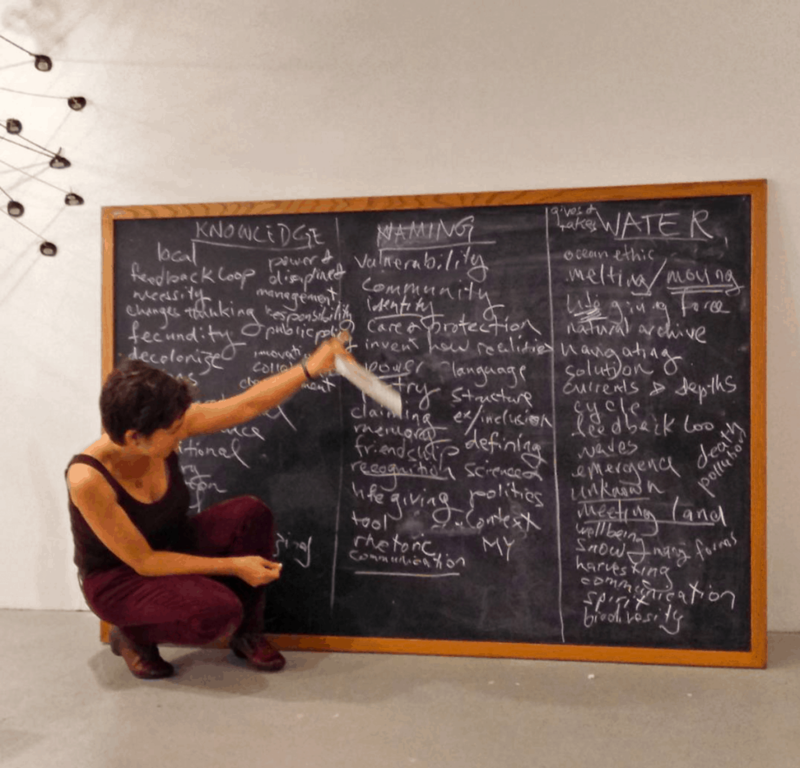 I thought that the encounter of members from different disciplines – a sculptor and an ecologist; an art historian and an anthropologist; a curator and an environmental activist – might give rise to fascinating conceptual transformations over time. 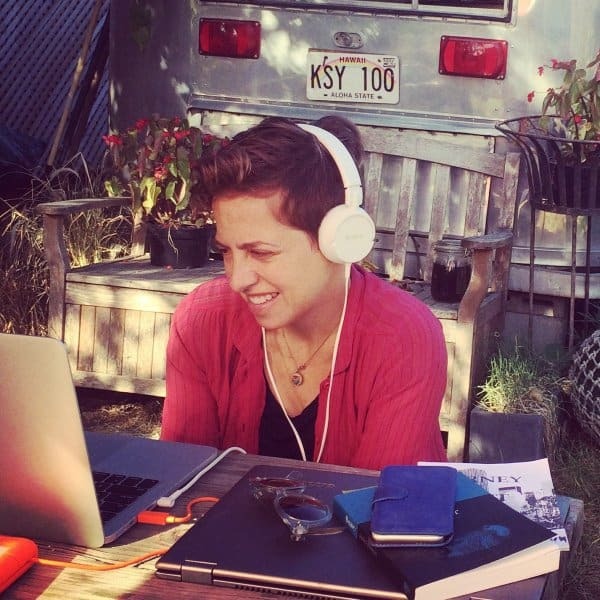 In the fall of 2015, I listened to about thirty hours of audio material, in addition to poring over copious written documents, photographs, and a few videos. Because we were interested in tracing the evolution of ideas over time, I divided up the documents according to the four phases, or the four ensayos the group has developed, and started tracing the paths between ideas expressed by the ensayistas. Grounded theory, which is an approach that avoids imposing a theoretical framework on the data, offered the best guidance for coding. It facilitated the perception of a theory or theories from the primary sources themselves. I was especially interested in instances where ensayistas connected concepts by articulating a causal or correlational relationship between them. I found, for example, that when glaciers came into the conversation, time was conceptualized differently, in a longue durée perspective, or that discussions of beavers and attempts to understand the world from their perspective gave rise to explorations of wonder and speculation. 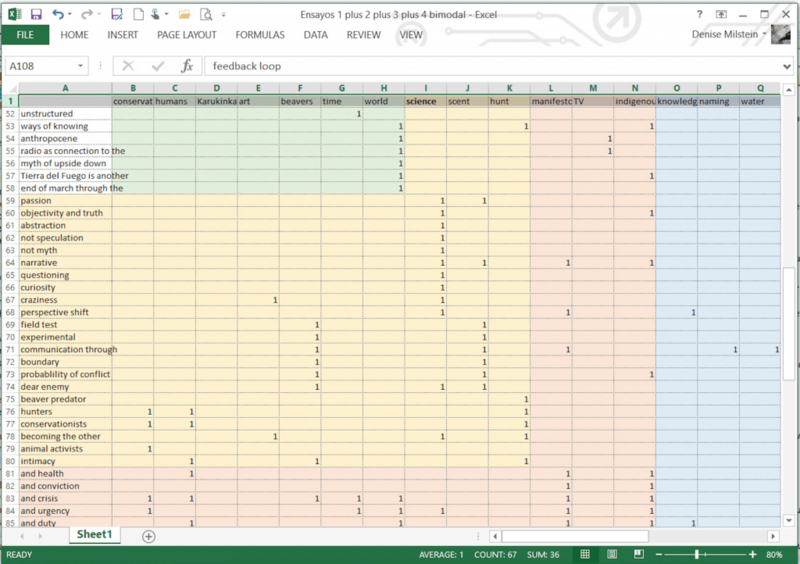 Because I used a coding language that reflected, as faithfully as possible, the language of the primary sources themselves, I ended up with hundreds of codes. The next step involved finding a way to make out the structure, if there was one, that emerged from coding all this material. After trying several strategies, I discovered that certain concepts came up with much greater frequency than others, for example, the word “beaver,” which stood for the species that has invaded and depredated much of the fragile forest ecosystem of Tierra del Fuego, or the idea of “conservation,” “knowledge,” “naming,” and “water” which emerged later on. Once I was able to isolate the three to seven most frequent concepts that came up in each phase, I started searching for relations made explicit between these concepts. 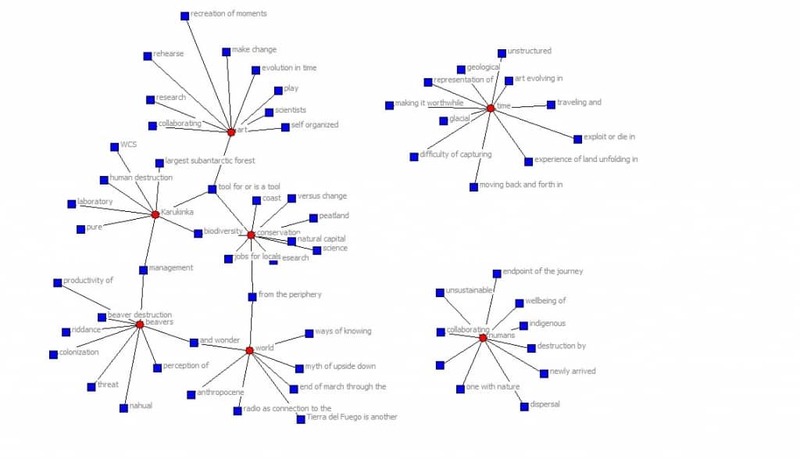 For example, the idea of beavers came up in conjunction with “management,” “colonization,” and “wonder.” This allowed me to create a bi-modal network made up of “nodes:” in this case, concepts; and “arcs:” the connectors between the concepts. In a bi-modal network, you have two types of elements. One set serves as a series containers, such as the most frequent concepts, and the other set “fills up” those containers. Another way to envision a bi-modal network is to imagine a study of friendship cliques. The containers might be parties, which, according to attendance, will be filled with party attendees. There may be some overlap among parties because individuals might attend multiple parties. Likewise, the most frequent concepts shared other concepts among them. The result of this coding exercise is the network below, for Ensayo 1. There you can see the “container” nodes as the red circles, and their “attendee” nodes as blue squares. The “arcs” or lines between the concepts represent a causal or correlational connection made in speech. 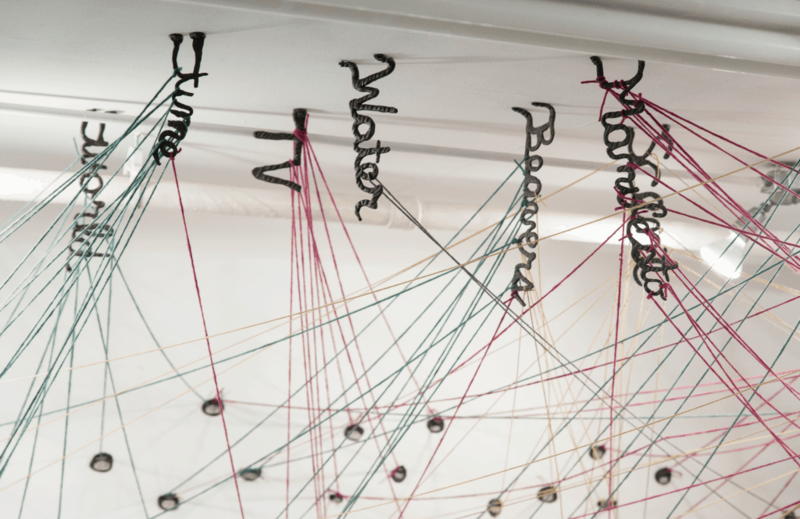 This initial conceptual network shows, for example, that during the first Ensayo, members discussed the concept of time quite a bit, in relation to traveling, or in relation to art and how it evolves in time. 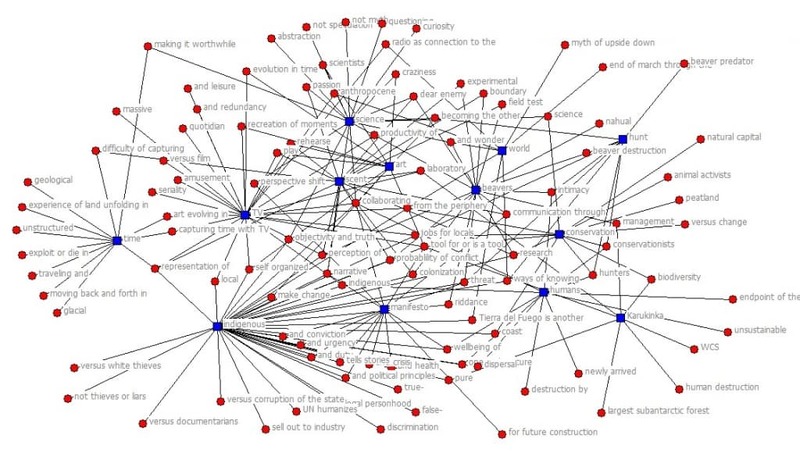 You can also see that “conservation” was on the table as a concept in contradistinction to “change,” and in relation to “jobs for locals.” In this graph, the concept of “tool” attended three “parties:” “Karukinka,” “conservation,” and “art.” The connection was forged through multiple conversations, but the fact that the concept of “tool” came up repeatedly in different contexts indicates this concept is a key connector for ensayistas. A network can be represented as a graph such as the one above or in the form of a matrix, which you see below. 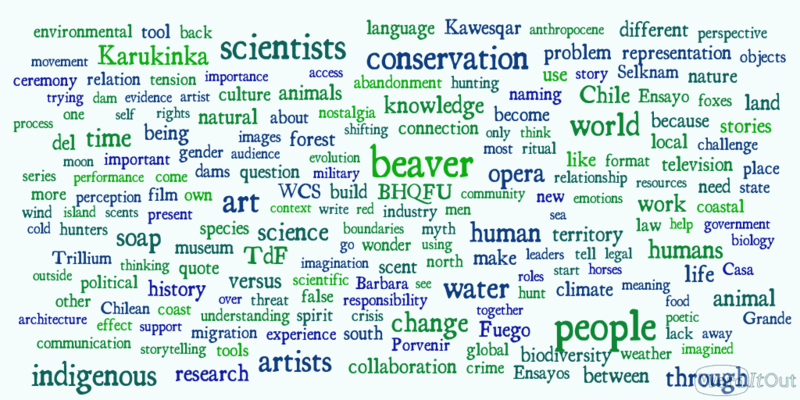 The image is the coding result of Ensayo 1, which examined the possibilities for multi-disciplinary collaboration and nomadic residency in Tierra del Fuego, and of Ensayo 2, which took up the question of invasive species, with a focus on beavers and the possibility for interspecies communication. The three concepts that came up most frequently in the material I explored from Ensayo 2 were “science,” “scent,” and “hunt.” Conversations during this time engaged intensely with scientific approaches to dealing with the beaver invasion, and explored and considered wildly varied solutions to the issue, from “hunting,” as a way of controlling and possibly decreasing the beaver population, to using “scent,” as a method for communicating with beavers, expanding our understanding of their perspective and agency, and creating a medium for negotiating a solution with the beavers themselves. 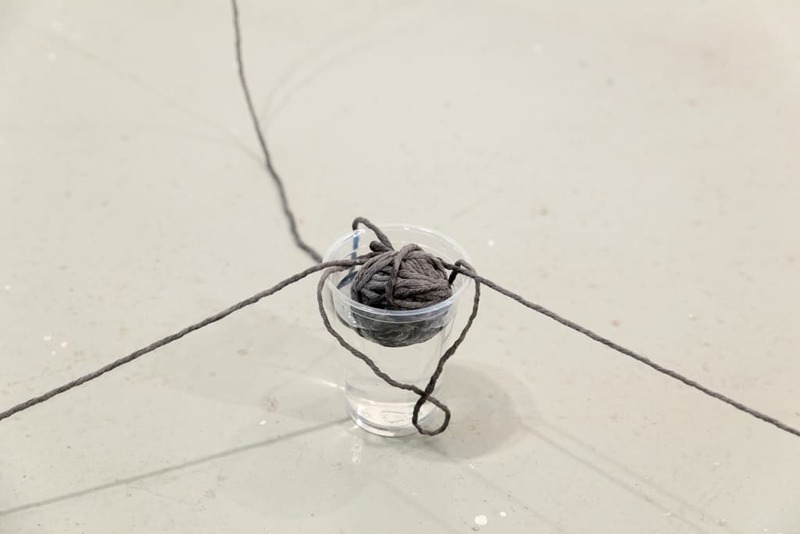 By the time I started working on Ensayo 3, Christy Gast had come up with a way to build a physical network with yarn and epoxy clay in a corner of the BHQFU gallery space. We were simultaneously using the space to hold a four week seminar on Ensayos and show the results of research, projects, and art work from the past year. As such, the ensayistas and students present all took part in the building. As you can see below, the “container” concepts were the words themselves, screwed to the ceiling. For the “attendees” we used anchors that attached to the wall, each one labeled with the name of the node. As we built the network together, in small and large groups, the process of building itself became an opportunity for critical reflection. We discussed the Ensayos and we explored, critiqued, and tweaked the method for coding and network building that we were using for try to understand our work. In this way, we continued from Ensayo 2 to Ensayo 3, which, at the time was evolving to incorporate oral history to the process of creating a television series. The one hour features would blend a variety of filmmaking approaches to reflect the institutional and juridical conflicts which entangle the people who live in Tierra del Fuego with each other, the state, and its institutions. The key concepts there were “manifesto,” “TV,” and “indigenous,” and by the time I was done coding it, we had three superimposed networks, which made for a compelling though challenging network to interpret! Still, the sculptural representation of this network allowed us as constructors and then as viewers to travel from one node to the next over the arcs, and to think and consider the meanings of all these connections. The last Ensayo, number 4, is new enough that I had very little data to work through. And yet, the majority of the members of Ensayo 4 were present in New York for the BHQFU residency. We decided as a group to turn the process inside out and generate our own network by brainstorming the nodes and arcs between them. This unexpected methodological turn became a fascinating experiment in participatory action research. The work of creating our own connections after three weeks of observing the materialization of the networks forged over the previous years allowed us to look into the future in a new way. We built the Ensayo 4 network last, and by the time we were done, we could see the results and differentiate among phases according to the color of the yarn. We followed the arcs between nodes, but, as with any map, the work in itself did not fully represent the voices that had contributed to building it. The next phase in this project involves exploring different mediums, including virtual reality, as tools to facilitate traveling through these networks without losing sight of the content or the interacting agents. The connection to primary sources is key, especially because we expect to engage our audiences actively, that is, to use the network to open spaces for reflection, discussion, and for envisioning the future. 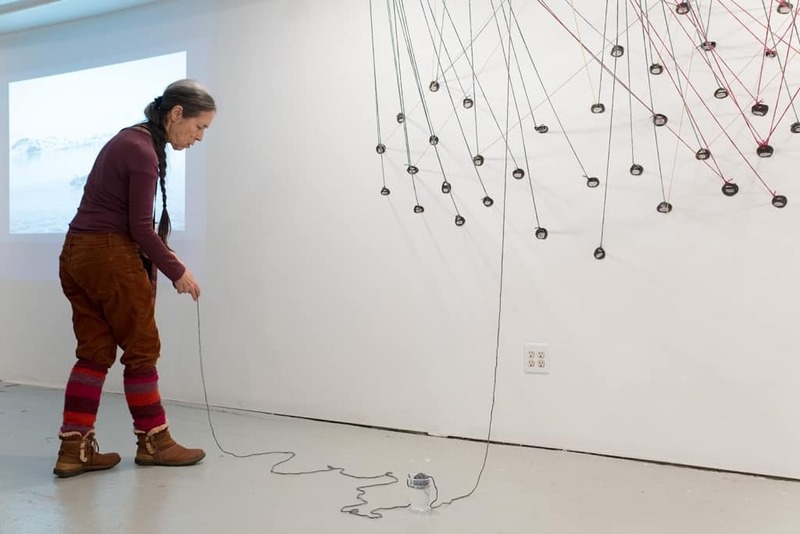 On the closing day of the BHQFU exhibition, Cecilia Vicuña, Chilean poet and artist, performed a piece that began under our installation of the network. 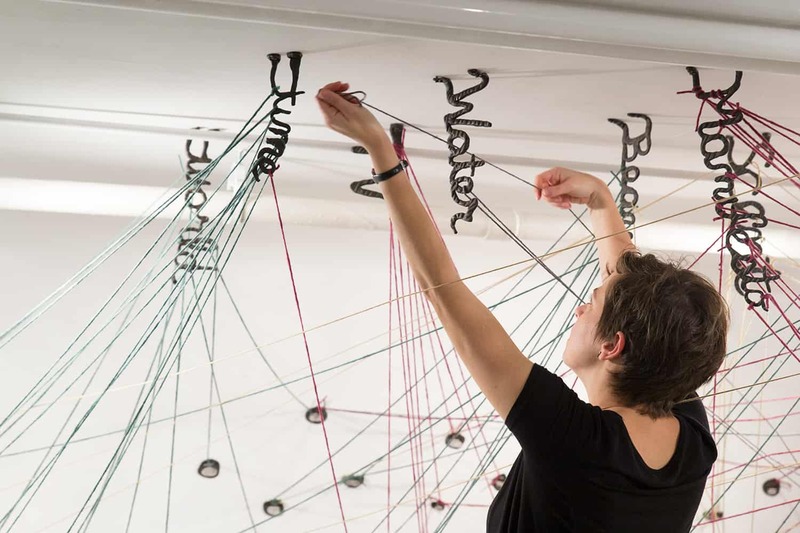 She attached the end of a ball of yarn to the word “water,” one of the container nodes for Ensayo 4, and led it, trailing, over the floor, then wound it loosely around the ensayistas and our guests, until her extension of the network meandered all around the room. We could feel the connections between us with every movement, as the yarn tightened or loosened. Wound up in the yarn, we listened to Cecilia chanting in semi-darkness, as she wrapped the yarn around a final ensayista, the youngest one, and dipped the end of the ball of yarn in a glass of water. 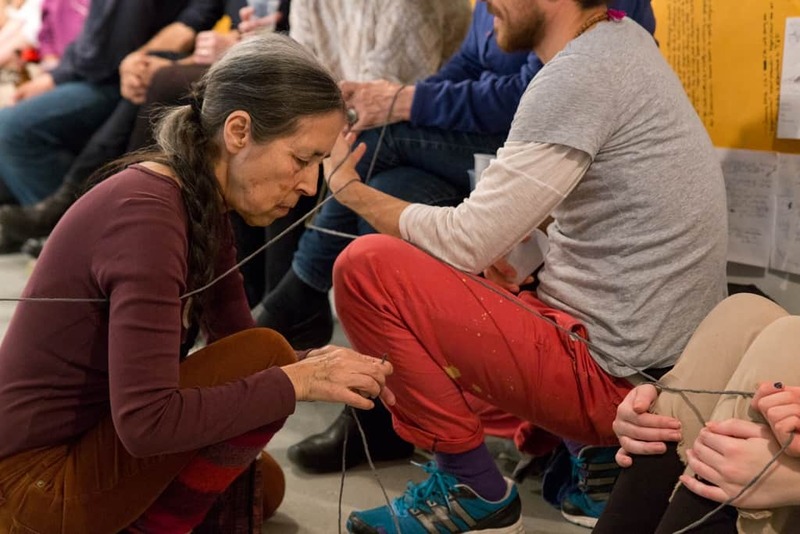 The performance took us beyond the intellectual experience of the network, into an experiential realm where the connection became tangible. In that moment, the borders we typically construct between intellect and emotion, and between ourselves and the non-human world, dissipated. Our ideas about the past and future, our experiences, our physical presence and relationships with each other and the world, all led to the water in the glass, and through it, back into our connected selves.